Most operating systems provide functions to read and write data on files. •It then translates requests for operations on files into operations that the disk controller can carry out. For an operating system to run, it must be loaded into the Random Access Memory (RAM). When a computer is first turned on, it launches the bootstrap loader. The primary functions of bootstrap are to test the computer hardware and to locate and load the operating system into RAM.
. In this test, the central processing unit (CPU) checks itself first and then checks the computer system timer. The POST checks the RAM by writing data to each RAM chip and then reading that data.Any difference indicates a problem. If the POST finds errors, it sends a message to the computer monitor. If the POST finds errors that cannot be displayed on the monitor, it sends errors in the form of beeps. The POST sends one beep and the screen begins to display OS loading messages once the bootstrap has determined that the computer has passed the POST. The meaning of any beep code depends on the manufacturer of the BIOS,there are 3 major manufacturers of BIOS chips. The number of events that happen in the boot process depends on the version of Windows and whether it is a cold boot or a warm boot. Warm boot – Performed whenever the PC is restarted or reset with the power still on. Cold boot – Starts whenever the PC power switch is turned on. Computer cases are either desktop or tower models. The desktop model sits on a desk horizontally. The monitor can be set on top. The tower model stands upright in a vertical position that allows easy placement on the floor. Mini-tower, mid-tower, and full tower cases are available. 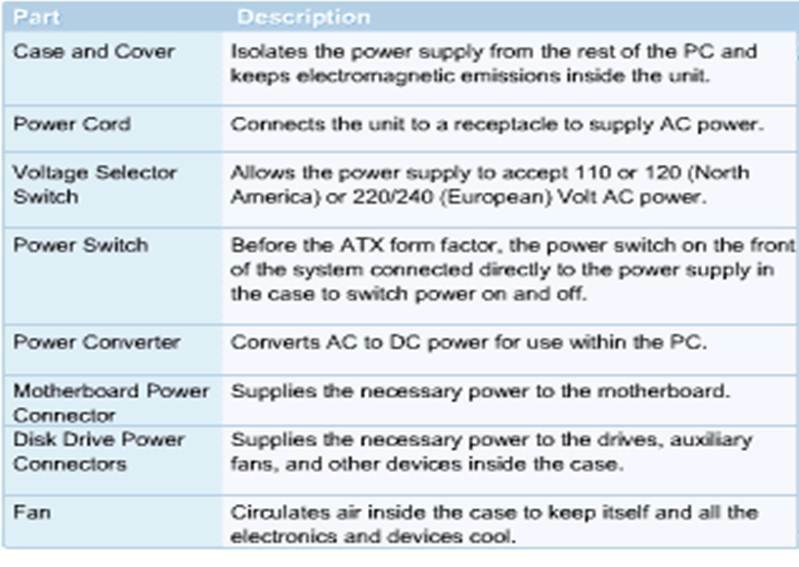 A power supply provides the needed voltage to power the various electronic circuits that make up the PC. A power supply provides the needed voltage to power the various electronic circuits that make up the PC. It receives external power and AC electricity. It is contained in a metal box. Within this box, a transformer converts the current that is generated from standard outlets into voltages and current flows that the computer parts need to operate. A fan installed in the power supply prevents the computer and its components from overheating by maintaining an air flow. The power supply fan helps prevent the computer components from overheating by maintaining airflow in the case. Computer cases made of aluminum create a much cooler environment for the installed components. Liquid cooled cases new. They introduce water as a cooling agent. Liquid cooling units fit most cases that have a place to mount a back exhaust fan. Everything else in the system plugs into it, is controlled by it, and depends on it to communicate with other devices on the system. 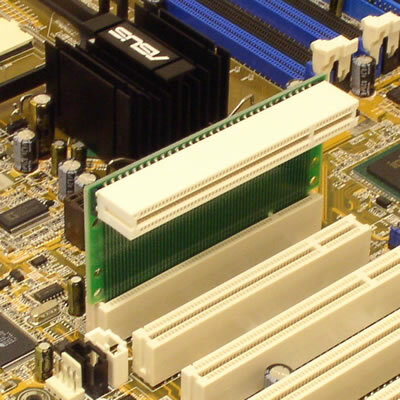 The system board is the largest of the printed circuit boards and every system has one. It houses the CPU, the controller circuitry, the bus, RAM, expansion slots for additional boards, and ports for external devices. The motherboard chip set determines the motherboard’s compatibility with several other vital system components. It consists of a group of microcircuits contained on several integrated chips or combined into one or two very large scale integration (VLSI) integrated chips. These are chips that have over 20,000 circuits. T Most new systems come with the ATX motherboard form factor. 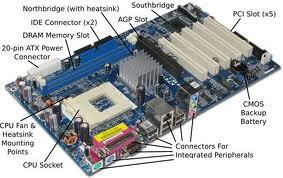 The components found on a motherboard can vary depending on its age and level of integration.
. These are the most common items found on a typical modern motherboard. Control unit – Instructs the rest of the computer system on how to follow a program instructions. Arithmetic/Logic Unit (ALU) – The ALU performs both arithmetic and logical operations. Arithmetic operations are fundamental math operations. Register – This is mainly for storage purposes. The processor handles most of the operations that are required of the computer by processing instructions and sending signals out, checking for connectivity, and ensuring that operations and hardware are functioning properly. It acts as a messenger to major components such as RAM, the monitor, and disk drives. The CPU speed is not controlled by the microprocessor itself, but by an external clock located on the motherboard. The speed of the processor is determined by the frequency of the clock signal. 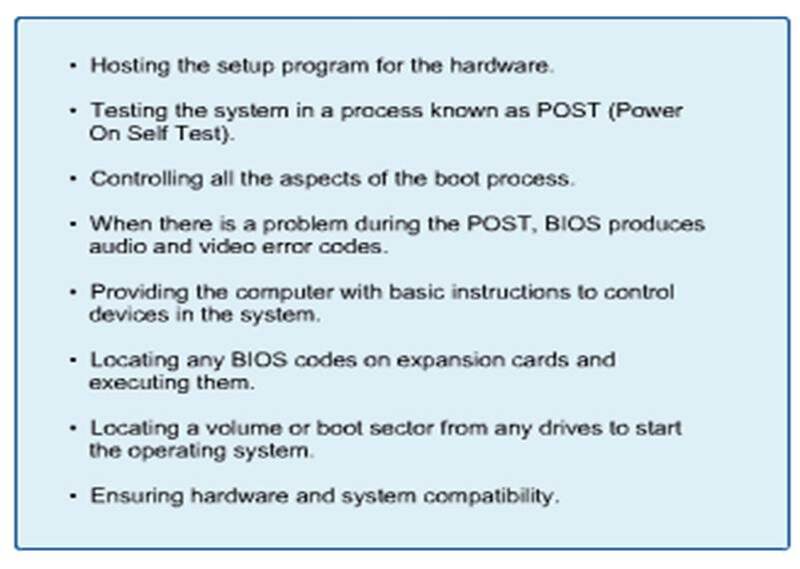 The instructions and data in the ROM chip that control the boot process and the computer hardware are known as the basic input/output system (BIOS), sometimes called firmware. The ROM chip that contains the firmware is called the ROM BIOS chip. It is also referred to as ROM BIOS, or simply BIOS, and is usually marked “BIOS” on the motherboard. The responsibility of the BIOS is to serve as a liaison between the computer operating software and the various hardware components that support it. Read only memory (ROM) chips, located on the motherboard, contain instructions that can be directly accessed by the microprocessor. Data transfer from ROM is faster than any disk, but slower than RAM. Some examples of ROM chips that can be found on the motherboard include BIOS ROM, electrically erasable programmable read-only memory (EEPROM), and Flash ROM. EPROM and EEPROM are ROM chips that can be erased and reprogrammed. Erasable programmable read-only memory (EPROM) is a special type of programmable read-only memory (PROM) that can be erased by shining ultraviolet light through a clear window on top of the chip.
. Flash ROM holds the firmware, or BIOS, in most new systems. 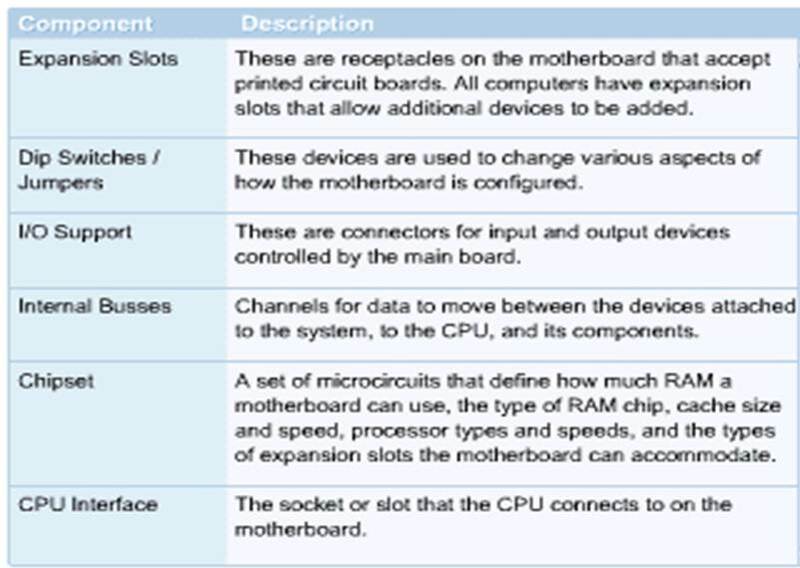 Expansion slots (sockets) are receptacles on the computer motherboard that accept printed circuit boards. Riser card – used when a computer is fully loaded to physically extends a slot so a chip or card can be plugged in. In low-profile, space-saving cases, cards are plugged into riser cards that reside parallel with the motherboard. Audio/Modem Riser (AMR)- a plug-in card for an Intel motherboard. The AMR evolved into the Communications and Networking Riser (CNR) card, which added LAN and home networking functions. The CNR is a 30-pin interface that accommodates two formats making various audio/modem and audio/network combinations possible. All the basic components of the computer are connected together by communication paths that are referred to as buses. There are three major system bus types that can be identified based on the type of information they carry. Random access memory (RAM) is the place in a computer where the OS, application programs, and data in current use are kept so that they can be quickly reached by the processor. 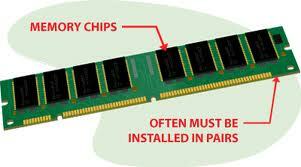 RAM is considered temporary, or volatile memory. The contents of RAM are lost when the computer power is turned off. The more RAM a computer has, the more capacity the computer has to hold and process large programs and files. 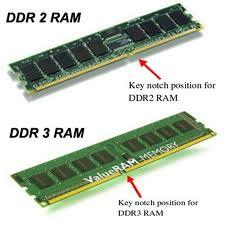 There are two classes of RAM that are commonly used today. 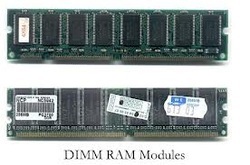 These are Static RAM (SRAM) and Dynamic RAM (DRAM). SRAM is relatively more expensive, but it is fast and holds data when the power is turned off for a brief period of time. This is useful in such circumstances as an unexpected loss of power. It is used for cache memory. DRAM is inexpensive and somewhat slow, and requires an uninterrupted power supply to maintain the data. DRAM stores data in tiny capacitor that must be refreshed to maintain the data. Once the power is turned off, the data is lost. A SIMM plugs into the motherboard with a 72-pin or 30-pin connector. The pins connect to the system bus, creating an electronic path through which memory data can flow to and from other system components. A DIMM plugs into the system's memory bank using a 168-pin connector. The pins establish a connection with the system bus, creating an electronic path through which data can flow between the memory chip and other system components. Cache is a specialized form of computer chip or firmware that is designed to enhance memory performance. Some systems use COASt modules. These modules provide cache memory on many Pentium-based systems. The COASt module is noted for its reliability and speed because it uses the pipeline-burst cache, which is significantly faster than an SRAM cache. The COASt module essentially resembles a SIMM, except that it is taller and has a different connector. 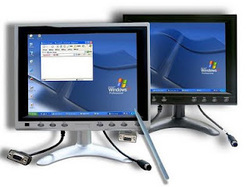 Monitors are available in different types, sizes, and characteristics. When purchasing a new computer, the monitor may have to be purchased separately. Understanding the characteristics of a good monitor will help determine which is best suited for a specific system. The following terms relate to monitors. Pixels are picture elements, Dot pitch, refresh rate, Color depth, Video RAM (VRAM) Resolution varies based on the number of pixel. The video card or video adapter is the interface between the computer and monitor. The video card tells the monitor which pixels to light up, what color the pixels should be and the intensity of the color. The display capabilities of a computer depend on both the video adapter and the monitor. 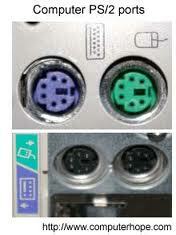 All peripheral devices that connect to the computer use connectors on the back of the computer known as ports. 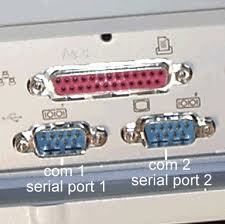 A serial port can be used to connect devices that use a serial interface such as a modem, scanner, mouse, etc. 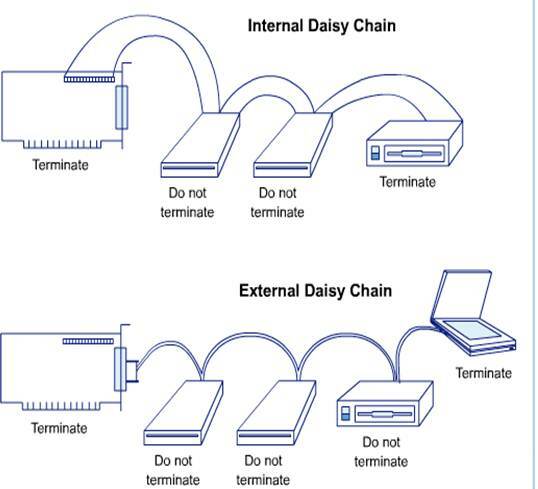 A parallel port is a socket on the computer that is used to connect a printer or other peripheral device such as a portable hard disk, tape backup, scanner, or a CD-ROM. The Universal Serial Bus (USB) is an external port and allows user to connect up to 127 external PC peripherals, including USB keyboards, mice, printers, modems, scanners, and external disk drives. 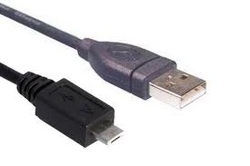 FireWire, also known as i.LINK or IEEE 1394 is a high-speed, platform-independent communication bus that interconnects digital devices such as digital video cameras, printers, scanners, digital cameras, and hard drives. Integrated Drive Electronics (IDE) is a type of hardware interface widely used to connect hard disks, CD-ROMs, and tape drives to a PC. 20 GB IDE hard disks have become entry level. The IDE interface is officially known as the AT Attachment (ATA) specification. Enhanced IDE (EIDE) or ATA-2 disk drives is the "new and improved" IDE. The EIDE interface can handle up to 8.4 GB or more. Ultra ATA disk drives are typically much faster than the older ATA and ATA-2 disk drives. Typical Ultra drive sizes can go up to 50 GB or more. The internal hard drive is connected to a disk controller with a cable. The hard drive and other devices can use one of two types of interface controllers to work with the computer. These include the Enhanced Integrated Drive Electronics (EIDE), and Small Computer System Interface (SCSI, pronounced "scuzzy") connections. SCSI devices have the controlling electronics on each of the drives. However, SCSI is a much more advanced interface controller than ATA-2/EIDE. It is ideal for high-end computers, including network servers. 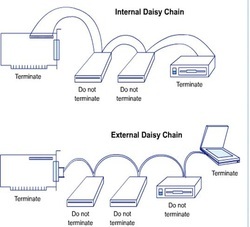 SCSI devices are typically connected in a series, forming a chain that is commonly referred to as a daisy chain. SCSI-1, was used by many Apple computers in the early 1980s. By today’s standards it was rather slow. SCSI-2 uses two different signaling systems, known as single-ended interface and differential interface. The two signaling systems are incompatible and cannot be mixed on the same SCSI bus. 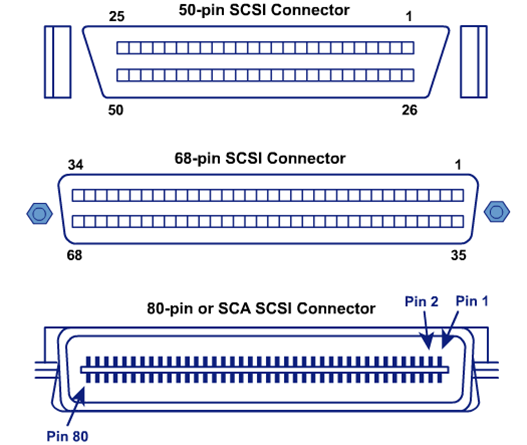 This figure shows an example of a 50-pin, 68-pin, and 80-pin (SCA) connector. 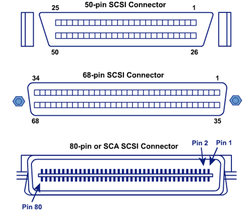 SCSI-3 is the latest standard of the SCSI family. It combines all the best features of the previous SCSI standards. The HDD has a much larger storage capacity than the floppy for long-term storage. It stores programs and files, as well as the operating system. 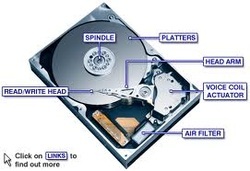 Typically, the HDD is an internal drive that cannot be removed from the computer. disk platters, read/write heads, head actuator assembly, spindle motor, logic/circuit board, bezel/faceplate, configuration jumpers, and interface connectors. Personal computers have at least one HDD installed inside the system unit. If more storage capacity is needed, another HDD can usually be added. The capacity of the HDD is a measure of how much information it can store. The major components within a CD-ROM drive are the optical head assembly, head actuator mechanism, spindle motor, loading mechanism, connectors and jumpers, and logic board. Data is stored in the form of indentations and bumps on the reflective surface of every CD-ROM disk. The indentations are called pits, and the bumps are called lands. 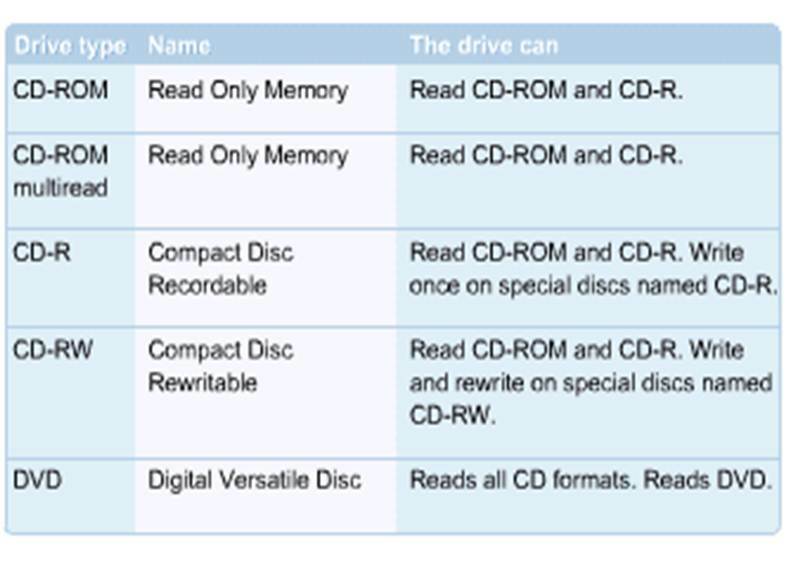 The most important specification for a CD-ROM drive is its speed, or how fast the disc will spin. The faster the disc spins, the faster the data can be transferred to the computer’s memory. Two other important specifications to consider are the access time and data transfer rate. The DVD looks like a CD, but the storage capacity is significantly higher. For this reason, many software manufacturers are starting to put programs, manuals, and other documentation on one DVD instead of multiple CDs. Recordable DVD drives will become standard on computer systems just like the CD drive did. Tape drives are most commonly used as the device for data backup on a network server disk drive. There are a variety of tape devices that use different tape formats for storing data. 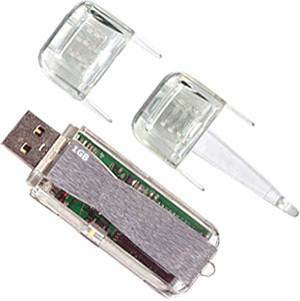 New USB storage devices can easily save and access 16MB, 32MB, 64MB, 128MB, 256MB, 512MB and 1GB. 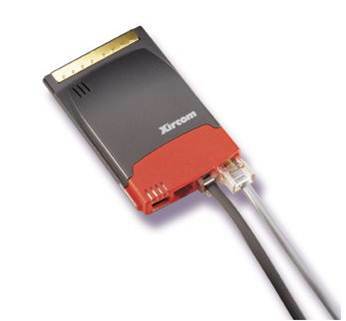 A modem is the primary way to connect to the Internet with Windows 9x through a dialup networking connection. 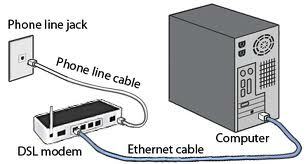 A modem is a device that converts the digital data used by computers into analog signals that is suitable for transmission over a telephone line, and converts the analog signals back to a digital signal at the destination. A Network Interface Card (NIC), is used to connect a local computer to a group of other computers so they can share data and resources in a networked environment. 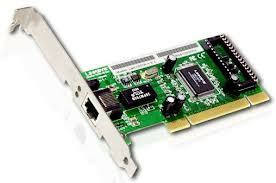 All network interface cards are designed to use Ethernet, Token Ring, or another similar protocol. 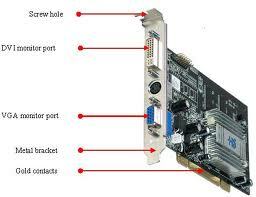 NICs come in form of expansion cards (PCI or ISA) that can be installed in one of the computers expansion slots. The network cable plugs to the computer through the adapter card or NIC. 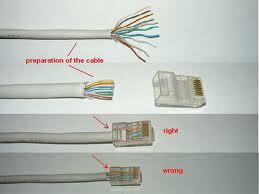 This is possible due to a connector type known as the RJ-45 connector it has 8 wires inside.